The Sopwith Triplane was designed by Tommy Sopwith of the Sopwith experimental department in 1916, about 150 were produced. Nothing quite like it had ever been built for military purposes before it's handling qualities were superb, it completely outclassed the German Albatros D-III in numerous victories against far grater numbers. Shortly after it's surprise appearance on the Western Front with the R.N.A.S. Fokker was able to obtain the wreckage of a Sopwith Triplane in order to analyse and emulate it's performance, soon numerous German and Austrian triplanes appeared including the infamous Fokker Triplane! The pictures below are of the Shuttleworth Triplane "Dixie II" serial N6290 ()G-BOCK, the original was just called "Dixie". "Dixie II" was built by the Northern Aeroplane Workshops from the original drawings, it was seen by the original owner of the Sopwith Aviation Company, Sir Thomas Sopwith, before his death in January 1989 aged 101, he was so impressed with the standard of work that he declared it to be a "late production" machine, rather than a replica, it sports an official Sopwith serial number plate on the engine cowl in recognition of this fact. Engine: One 110 hp (82 kw) or 130 hp (96 kw) Clerget radial piston engine. The last time the Sopwith Triplane, nicknamed the 'Tripehound', flew in battle in WW1 was with No.10 Squadron R.N.A.S. at Ypres, the squadrons re-equipping with the new Sopwith Camel in November 1917. 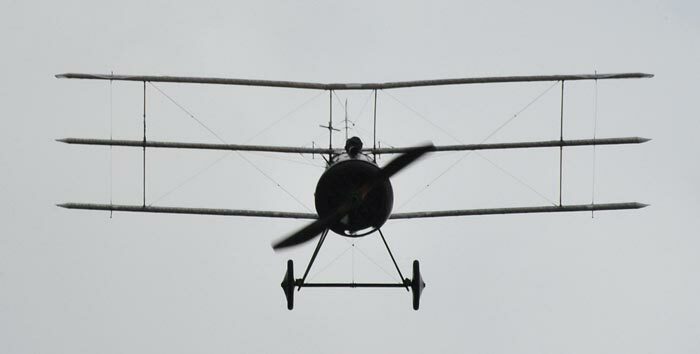 This picture of Sopwith Triplane is Copyright © June 2014 Siteseen Ltd. We only authorise non-commercial picture use and particularly encourage their use for educational purposes. This Sopwith Triplane picture is not in the Public Domain. 3) Use of this Sopwith Triplane picture, or any of our pictures on websites re-distributing copyright free material is strictly prohibited.